The earliest dateable part is the tower of c1200, altered in the C16. 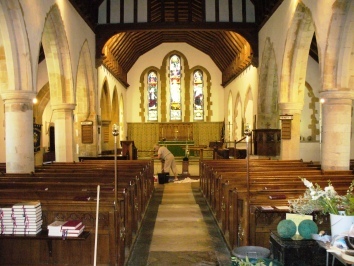 The large aisled nave is early C13, as was the chancel, which was mostly rebuilt in the C19. A ‘Norman’ arch that is said to have been found in the chancel in 1880 (CDK 1880 pt 2 p158) probably survived from the church known to have been here by 1200, but it was not recorded in detail and though Peat and Halsted (p35) also discerned earlier work, nothing older than the tower of c1200 is now visible. 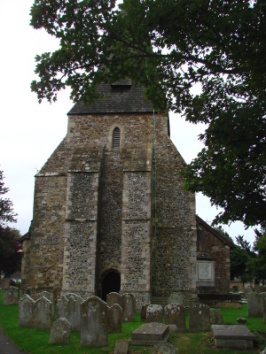 Built, like the rest, of mixed rubble and flint, it has small lancets and a double chamfered west doorway, slightly stilted and squeezed between later buttresses. It predates the rest of the church, for inside are shallow buttresses, of a kind common at this time; there were probably similar ones outside as well. The tower arch of the same date has low, square responds and a slightly chamfered pointed head. The VCH (4 p224) suggested it was inserted within a larger arch in the C16, but this is largely concealed by the organ and, furthermore, the form alone of the visible arch makes this unconvincing, although there was other work in the C16. Assuming the arch in the chancel was in situ and since the tower was presumably at the west end, the church must already have been large. Narrow aisles were added in the early C13. These have never been widened and the west lancets remain (see the Sharpe Collection drawing (1804)); that of the south aisle has a rere-arch with a scoinson. The five-bay arcades have alternately round and octagonal piers, though all abaci are round, and the spurred bases are conservative for the date. The inner orders of the double-chamfered heads spring from fluted and reeded corbels on the responds, which are chamfered with stops. 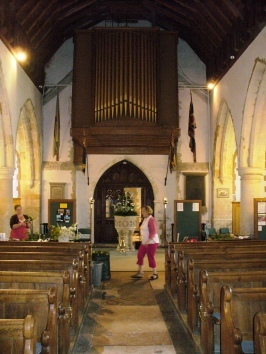 The chancel, though much altered, dated from the same period, as three long south lancets show. A single north one remains in situ, now opening into a C19 vestry. Inside, the sills are linked by a string-course. 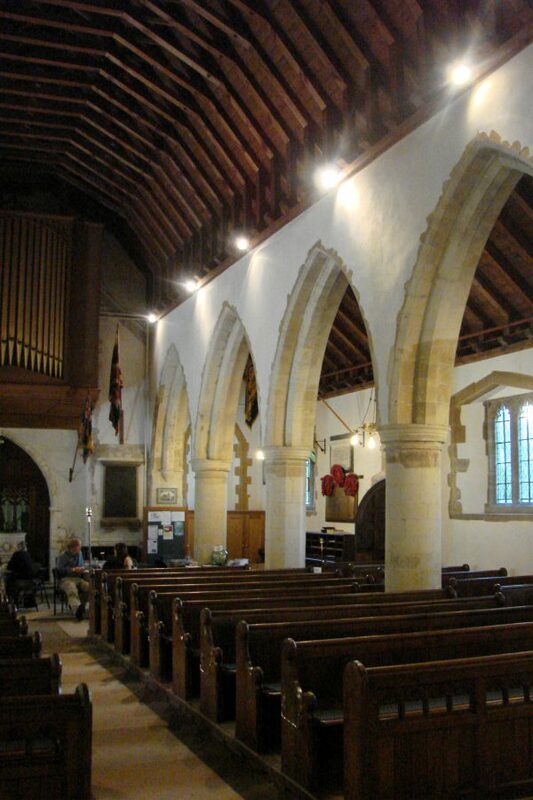 There is no chancel arch and with the large nave, the effect is notably spacious. There is no sign of further work before the C16. The heavy external buttresses of the tower are not bonded in and a bequest in 1541 ‘to the reparacions of the Stepell’ can hardly refer to anything else. 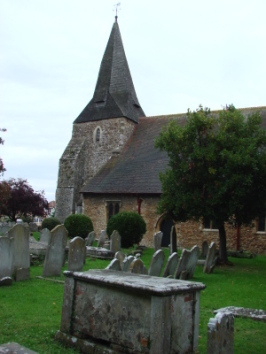 The shingled broach-spire and the square-headed aisle windows with fine head-stops may also date from this time, though only two hoodmoulds and their head-stops are original. 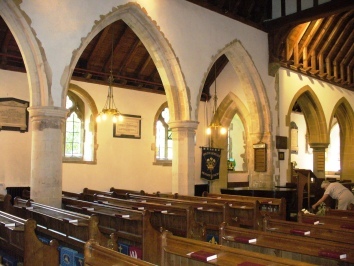 The chancel was remodelled, probably in 1737 (2 p169), with two small round-headed east windows which Quartermain ((W) 50) shows in 1856. He also shows the south aisle as it was rebuilt in 1764 (VCH ibid), with two tiers of segment-headed windows for a gallery. Though not apparent from the Sharpe, Quartermain’s or the Burrell Collection drawings (1790), the remaining head-stops indicate that some C16 windows must have survived in part at least. A restoration by E Christian was commissioned in 1872 (B 30 p352), but the relevant ICBS papers only start in 1879 and work seems actually to have begun in 1880 with the by then almost ruinous chancel (CDK 1880 pt 2 p122). 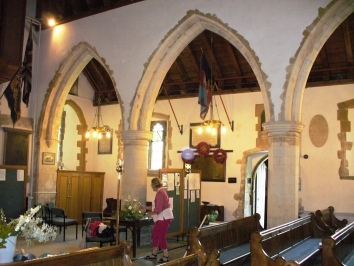 Christian inserted three stepped east lancets and added a north chapel or vestry, resetting the other north lancets from the chancel, from which it is separated by a two-bay arcade. 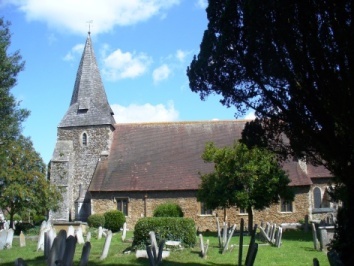 According to a contemporary account (BN 38 p784) he extended the chancel, but this is not apparent, though he replaced the roof, as he did in the following year in the nave. This has a wagon roof and the line of the previous one remains at the west end. 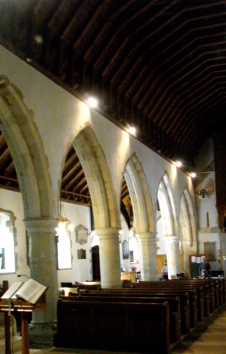 Between nave and chancel is a large tiebeam on head-corbels. Finally, Christian reinstated the north aisle, with mostly new windows of C14 design, and added a porch. 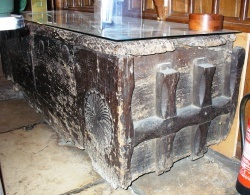 Chest: (South side of nave) C13 with ornamental roundels on the front. 1. Richly carved, 1899. Presumably the one for which J O Scott was paid 5 guineas for a design (BAL/MSS ScJo/2/2). 2. (Nave west end) Fragments of a typical late C12 arcaded square bowl of marble. 1. (East lancets) J Powell and Sons, 1880 (CDK ibid). The designer was C Hardgrave (Hadley list) and the strikingly dark colours place the glass among his best. They are best appreciated on a sunny morning. 2. (South chancel, first window) J Powell and Sons 1891 (Order book). Hardgrave was again the designer (ibid). 3. 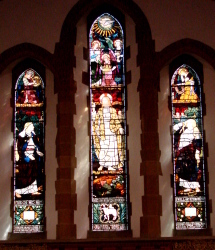 (South chancel, second and third windows) A Goslett and Co, 1885 (www.stainedglassrecords.org retrieved on 4/2/2013). 4. (East window, south aisle) J Powell and Sons. though dated 1908 the design by G Wooliscroft-Rhead dates from two years earlier (Hadley list). 1. (Over north doorway) Dr A C Tait, Archbishop of Canterbury (d1882). Only a bust remains. 2. (Outside at the west end of the south aisle) A late C18 wall-memorial has been left although it partially blocks the west lancet. 3. (In the churchyard) Modern memorial to Sir Richard Hotham (d1799). Painting: (Second pier of the south arcade from the east) Possibly C13, but it is now invisible. It may have been part of the paintings found at the restoration, then dated to the early C16 (see 1). Piscina: (South chancel) C13 trefoil-headed. Royal Arms: (Over south doorway) George I on painted panel. My thanks to Richard Standing who provided the photos of the interior and fittings except those of the glass and the south arcade and also that of the exterior to the south.